At CTCA, we work together to take care of all aspects of patient care. Treatments are all under one roof, making it very convenient for the patient. Dr. Suppiah graduated from medical school in the top 5 percent of her class at Sri Ramachandra Medical College and Research Institute in Chennai, India. 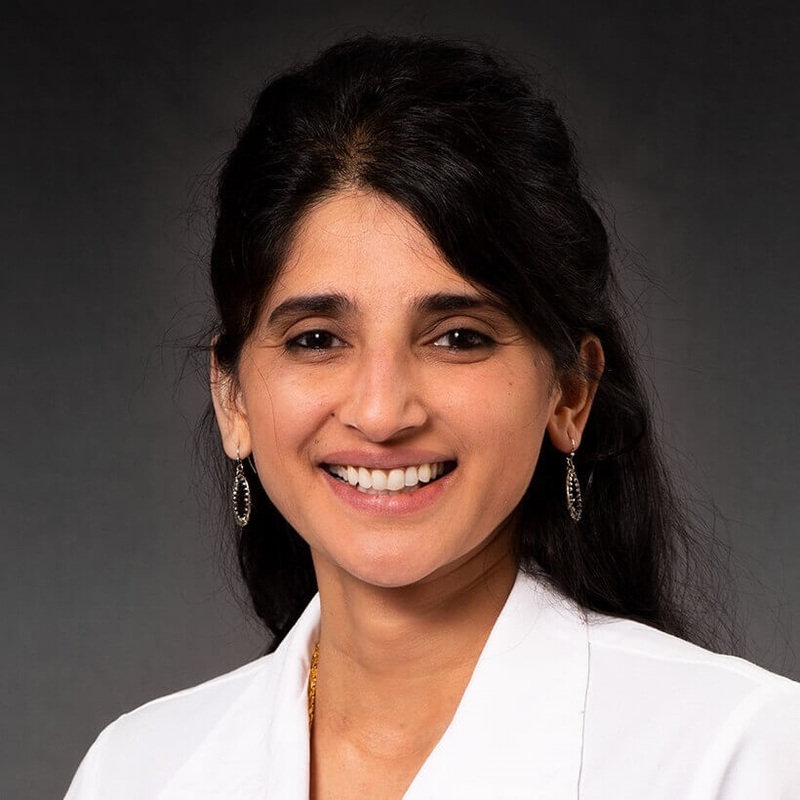 After completing her residencies at University of Missouri-Columbia School of Medicine and Sinai-Grace Hospital/Wayne State University, Dr. Suppiah began her fellowship at the Cleveland Clinic. Dr. Suppiah is board certified in hematology, oncology and internal medicine by the American Board of Internal Medicine. She is also a member of the American Society of Clinical Oncology. Dr. Suppiah is a core member of the group of physicians who make up the Lung Cancer Center at CTCA Chicago. In this role, she, along with other members of the lung team, focuses on helping patients diagnosed with lung cancer find treatment options that are appropriate for their type of cancer. In addition to her work in the Lung Center, Dr. Suppiah also works with patients facing other types of cancer. Throughout her career, she has co-authored numerous publications, as well as contributed to the books Washington Manual of Oncology and Clinical Malignant Hematology. Dr. Suppiah lives in Chicago with her husband and two young children. "Dr. Suppiah is amazing. i can't imagine having anyone else taking care of me. i trust her 100%"
"We are more than pleased with Dr. Supiah." "Dr. Suppiah is the best and yes I refer CTCA all the time"
"Dr.Suppiah explained to me everything about each chemotherapy drug, took time answering questions and I never once felt rushed. finding out that you have cancer is terrifying it still is but I definitely felt I was getting the best care that I possibly could"
"Dr. Suppiah has caused me a few concerns but I am still hanging in there with her to see because I had a good feeling when I met her." "Can't say enough about Dr. Suppiah have every confidence in her and her ability to treat my cancer from the beginning." "no help to this day with side effects from chemotherapy that ended [...]"
"dr. supieha is so nice!!!!" "[...] and I have nothing but good things to say about Dr.Sapiah. We could not have been blessed with a better Oncologist than her." "outstanding... "[...] she said 2 years ago when our doctor at home said you have [...] weeks to [...] months"
"very attentive and explained everything to my understanding, highly recommend"
"Dr. Suppiah is very genuine and caring. She makes sure to review test results thoroughly with the appropriate colleagues before walking us through the results." "I have complete trust & faith in my oncologist, Dr Suppiah. She is always caring & compassionate." "Very patient and understanding and she explained everything"
"Dr. Suppiah will answer any question asked but doesn't volunteer information. I'd like more info on what to expect and I want to be more aggressive with my tumor than she does." "Completely knowledgeabke, compassionate and reassurung." "I have complete confidence in Dr. Suppiah." "Dr. Revathi Suppiah, the team and staff have continued to be a tremendous blessing. She is the best physician I have ever had. Her professionalism, her positivity and her willingness to listen, while providing the appropriate care has been an important part of my recovering process." "[...]Dr. Suppiah & her team make me feel safe & well cared for." "very confident in all the Doctors and Staff"
"I tell everyone I know how we have been treated, and if it wasn't for the care he receives from CTCA my husband would be alive as long as he has." "she made me feel at ease and explained my options,"
"Dr. Sapia is the best. period." "I would recommend Dr. Suppiah to everyone I know dealing with cancer." "Thank you for your time, patience and service:"
"Dr. Suppiah is wonderful. gentle, kind, knowledgeable." "very happy with my doctor"
"She is very knowledgeable and helpful." "Dr. Suppia and staff are wonderful to have on your side in a time that could be very depressing." "Dr. Suppiah is very thorough and straight forward. Her expertise is amazing. I am well pleased." "I would and do recommend the center." "Dr. Suppias was very explanatory and kind and told me what to expect."